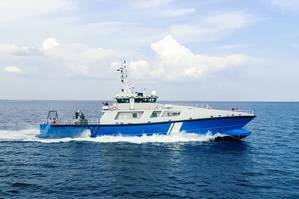 The new vessel, Raju, is the largest patrol vessel ever built by Estonia's Baltic Workboats, and is the first in the firm's emerging range of battery hybrid patrol ships. Peeter Raamat, Head of Technical Department at Baltic Workboats, explained, "We looked into the operating profile and decided this would be an excellent project to build as a hybrid vessel. We chose to work with Danfoss Editron due to the fact that it is a very flexible and very good system. Also, the size of equipment is very small. This is really important for the ship builders because there is never enough space." The Editron marine system is half the size of a conventional diesel-electric propulsion and power plant system. The system's highly-efficient and lightweight Danfoss Permanent Magnet Machines reduce fuel and running costs, significantly reducing both payback period and CO2 emissions. The vessel's control and monitoring software, and the control systems are all integrated into one single system made by Baltic Workboats. Raamat said, "The needs of the patrol boat made it an excellent project to build as a hybrid vessel. For example, the hybrid electric benefit of engine redundancy is important for the Estonian Coast Guard - in case of engine failure, you can switch to diesel-electric or batteries - while you also have improved fuel efficiency, and much lower noise levels in diesel-electric and fully-electric modes when compared to big diesel engines, which is a big benefit for the crew." The Editron propulsion lets it leap into action with a top speed of 27 knots, while the fully-integrated energy storage system allows electric cruising at typical working speeds of up to 10 knots. The Editron marine systems' extremely low vibrations and noise also give the patrol boat the ability to run in stealth mode while carrying out anti-smuggling operations. Ahto Mägi, Boatswain of Raju, helped rescuing more than 400 refugees in the Mediterranean on his former ship, and for him multifunctionality is the most important ability of a vessel: "The first impression for me about the ship is that it is really fast." Jani Hartikka, Project Manager at Danfoss Editron, commented, "The specialty of the ship is the flexibility between the operational modes. In full electric mode the vessel can go up to 10 knots without engine noise or vibrations. When you are mooring somewhere during nighttime, the energy consumption is very low, and you can sleep in a quiet vessel. Which is unique. At least from a crew's point of view. "With changing regulations, I see that the demand for such hybrid electric solutions will grow rapidly in the near future as ship owners switch to electrical vessels to reduce their CO2 emissions. Creating this unique vessel together with Baltic Workboats already puts us on the front line of development." In this case, the patrol boat's ability to run cleanly and quietly means that it is already prepared for stricter environmental regulations, while its Editron marine systems' durability and shock-resistance make it well-suited to the extreme conditions faced on open waters in the Gulf of Finland.